Browsers are large, complex pieces of software. How are all those crash reports received, processed and filed into relevant bug reports? Facebook has 100 million users in India. You know who has a billion? The Indian Census. Everyone loves a viral story. What exactly is “viral”? How do you measure it? How does the math work? These, and a number of large dataset challenges and innovations, have been showcased at The Fifth Elephant – an annual HasGeek conference on big data and analytics. Since it’s first edition in 2012, The Fifth Elephant has served as a platform to announce important technologies including file systems and databases. It has inspired innovators to use the conference stage to talk to developers and data scientists, a notable example being Viral Shah, co-creator of Julia – a new high-performance Python-like language for statistics. Analytics infrastructure: platforms, tools and in-house solutions. Data mining and machine learning: applications in different domains. 1. Keynote speech by Dr. Anu Acharya – CEO of Mapmygenome project – on “personalized medicine and big data”. 2. Talks from the fields of retail, banking, medicine, finance and advertising on how machine learning is applied to mine data in these sectors. 3. A talk on “deep learning”, a futuristic perspective on machine learning by Dr. Vijay Srinivas A. 4. Two panel discussions: one on analytics technologies, and second on how CIOs make decisions about using analytics for enterprises. The Fifth Elephant is organized by HasGeek. HasGeek helps people in technology meet each other via conferences, and a popular technology job board –hasjob.co Our purpose is to help geeks learn from other geeks. After all, who better to explain things than someone who had the same questions a while ago and went on to find answers? Or even better, the person who created the technology you are interested in? HasGeek organizes conferences, gatherings of incredibly smart people. We host JSFoo, Droidcon India, Meta Refresh and Rootconf. 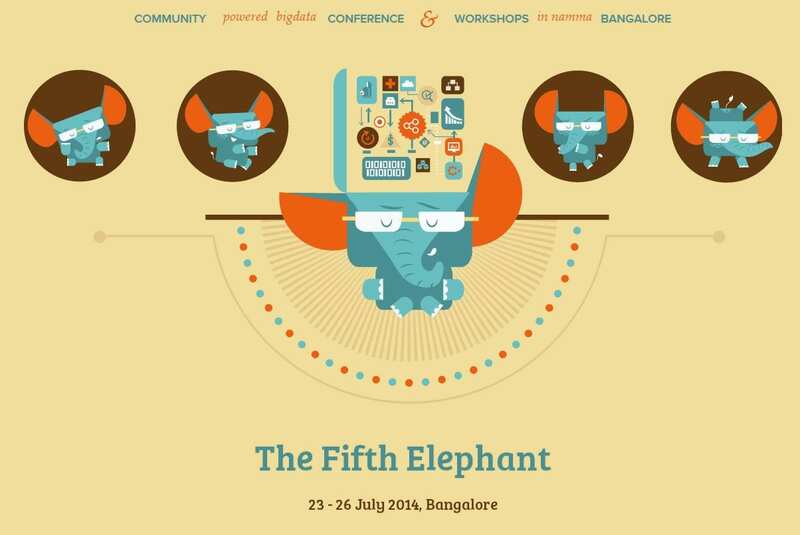 This July we are hosting our biggest event of the year, The Fifth Elephant, a conference on big data and analytics. With over 700 participants and 30+ speakers from all over the world, including the creators of technologies your company is dependent on, you have to be there. For more information, write to info@hasgeek.com or call 080-67684422.